Spring is here and for those north of the equator it means the return of various species of birds to their summer homes. In my case it’s the Canada Geese who have been roaming the golf courses and grocery store parking lots already. To celebrate this time, why not have a look back at one of the most phenomenal achievements in documentary cinema – the Oscar-nominated “Winged Migration”. Four years in the making a trio of French directors achieved what, on paper or in a pitch, would sound like the impossible. 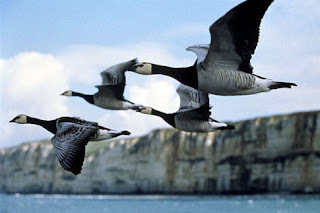 Show the migration patterns of birds in their natural habitat, in flight, across every conceivable natural environment. The technical achievements are astounding but with some clever editing a beautiful and often touching story with characters creep through what could have been a mere nature show. We quickly learn that every year hundreds of species of birds fly across thousands of kilometres from north to south and back to very specific places they call home guided by a unique geo-navigational system in their bodies. We get to see geese, eagles, cranes, swans, in flight, or in the case of penguins, on the ground, from some of the most astonishing viewpoints ever imagined. Filmmakers use ultralight gliders, boats, balloons, almost every conceivable transportation vehicle to get their cameras inches away from the birds, and thus the audience in flight with these creatures. Even on the ground, the cameras seem invisible to the birds. In the opening sequence we watch a camera track across the ground inches in front of a small bird in an astonishingly detailed close-up. We are so used to seeing birds and other animals in nature programs shot with long telephoto lenses, in "Winged Migration" the wide-angle close-ups combined with its crisp 35mm photography allow us to see the detail in every feather. The fascinating making-of documentary on the new Blu-Ray (as well as the old DVD edition) looks behind the curtain to how it was all done. And it certainly wasn't cinema verite. We watch the early process of the filmmakers to birth their winged characters and imprint the filmmakers' likenesses into their memories thus allowing them be natural and comfortable with the cameras. And so, in many ways the filmmakers became mother-figures to the birds, following them where they chose to go. A year later, once the birds matured, filming could being, a process which often took months to get one shot and mere seconds of screentime. The production may have been an exercise in patience, but the final film is not. While it might seem like just a lot of birds flying around every scene is filled with beauty, humour and strangely, suspense and adventure. Individual scenes are crafted by the filmmakers capturing the challenges and strange rituals in their characters' lives. The red-hooded crane provides what seems like an elegant choreographed dance sequence, the Canada geese are given a fun scene to play in the desert next to an abandoned jeep, and at one point some of the birds are made the subject of target practice by an evil game hunter. Since the film was made in France, there’s a distinct Francais-whimsical tone. The opening theme is especially peculiar - a Frenchman singing a song about birds like something from a children’s TV show. And the narration is read by a heavily accented Philip Labreau. The filmmakers could easily have disguised its nationality with a Morgan Freeman-type actor doing the voiceover and used a Melissa Etheridge song for it's theme, but the film remains distinctly French, and all it's Euro-peculiarities.